Architect Ted Larson, contractor Randy Clowdus and landscape architect David Hocker renovated and created this spectacular home and landscape design.On nearly four acres, the most beautiful elevated point of White Rock Lake with 356 feet of frontage, you will find this 1936 renovated estate home. The talents of architect Ted Larson, contractor Randy Clowdus, and landscape architect David Hocker are showcased in this remarkable estate property offered for sale. A 270-degree view of White Rock Lake is seen from the four acres on a hill at the top of the finger peninsula at White Rock Lake. Beautifully terraced land, one of largest red oaks, a pool, and exquisite landscaping add to the enjoyment of the full view of the lake. Ted Larson, AIA, of Larson & Pedigo Architects, oversaw the renovation of this proud estate home originally owned by the oldest son of H.L. Hunt. The interior design of this home is approached as a stately lake house, conjuring up images of iconic lake houses in New England or maybe Wisconsin or Michigan where homes sit up from a lake with the wide front lawn descending to the water. The interior playfully accentuated the sense of a lake house along with the graciousness of Texas. The warm honey and amber colored white oak (sealed not stained) six-inch wide plank ceiling, cabinetry, trim, and baseboards reflect a Texas quality as they play off the wide plank walnut floors. The color palette of this home on White Rock Lake responds to the outside, including the lake, wildflowers, meadows, stone, 200 year old oaks, and forested edges of the property. Placed high on the hill, the swimming pool is offered privacy by the topography and has splendid views of White Rock Lake. 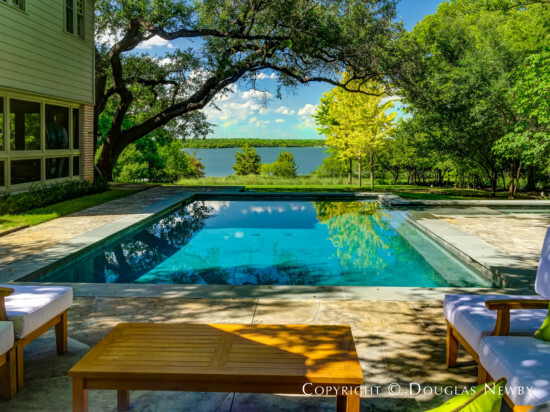 This recently built pool also accentuates the side screened porch that enjoys the views of the 3.95-acre estate and the breezes coming off White Rock Lake. The material qualities of the home, rooted in the 1930s, are gracefully contrasted with a refinement associated with the most prestigious homes. The natural luminescence of the home comes from the natural sunlight and the reflection off the Venetian plaster. Ted Larson designed the slender and sinewy polished walnut handrail that terminates with a circular sweep around the top of the oiled rubbed brass 1930s inspired newel post and is then capped with a subtle overlapping disk. The cast balustrades add to the sculptured quality of the staircase. The herringbone pattern of the narrow brick in the fireplace hearth is laid in a herringbone pattern reminiscent of both the work of Texas modern architect O’Neil Ford in the same period and the finest centuries old European fireplaces. The oil rubbed bronze hardware in the formal rooms came from Rocky Mountain Hardware or was cast in San Francisco. Architect Ted Larson determined the original footprint, including the screened-in porch, was the most elegant approach to the renovation and a design approach that further rooted the home in the period. Extensive renovations that enhanced the architecture of the home were made inconspicuously, extolling the virtues of the original design. Copper gutters and drain spouts, a slate roof, and an elegant entrance capture the spirit of the estate home. A sense of the familiar, bits of patterned wallpaper, and an occasional vintage sconce or shade accentuate the neat and tailored trim, custom metal, and hardware. This home evokes a style that is both current and timeless. Honed leather finished granite countertops, Ann Sacks metallic glazed ceramic penny tile, discreet oil rubbed bronze pulls, floating white oak cabinets with a recessed toe kick, granite countertops, and limestone floor laid in a herringbone pattern continue the lake house theme of refinement and warmth. Two Miele dishwashers with oak panels, Sub-Zero refrigerator with freezer drawer, Sub-Zero refrigerator drawer, Sub-Zero freezer drawer, Sub-Zero ice maker, Wolf six burner stove and double oven, Viking microwave, Viking hood, and Waterworks fixtures create a chef’s kitchen of convenience. The kitchen opening to a back terrace provides the practical and idealized space of a White Rock Lake home from another era. Waterworks, famous for their quality and design, contributed to the timeless elegance of this White Rock Lake home. Cobalt blue tile and subway tile mixed with square tile pull colors from the meadow one can see through the exterior window in the man’s master shower. The Waterworks footed bathtub, sink, and fixtures in the woman’s bath are elegant and understated. 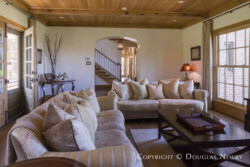 The craftsmanship of contractor Randy Clowdus throughout the house is impeccable. 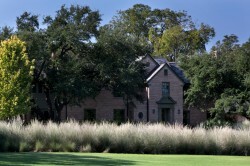 The American Society of Landscape Architects just awarded David Hocker, of the Hocker Design Group, the 2010 Honor Award for his Highland Park Pool House residential landscape design and for the landscape design of the Power House in Dallas. 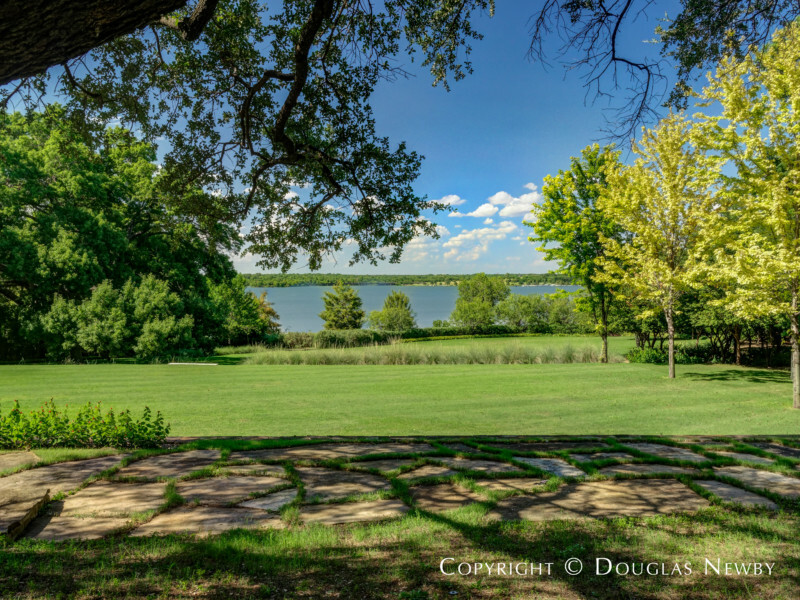 At White Rock Lake, landscape architect David Hocker created a tiered landscape of a wildflower meadow, view gardens, groomed forest, including 200 year old oaks, and lawn of native grasses with wide slabs of stone leading to the front door, accentuating the vista to the lake. 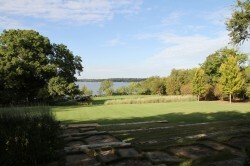 The asking price of this home is a good value for just these 3.95 acres of land on White Rock Lake. This wide lot has much lake frontage and spectacular views. As a bonus, you will acquire a home with the renovation architecture done by Ted Larson and extraordinary landscape design reflecting the best work of landscape architect and designer David Hocker. In addition, energy efficient systems, including a geothermal system, were part of the renovation.